The corner of 3rd and Howard St. at Moscone Center is looking a little bit empty these days, but for good reason. The SF Arts Commission has temporarily removed Untitled (Three Dancing Figures), Keith Haring’s colorful, three-figured sculpture, for a restoration that will include cleaning, removing graffiti, managing corrosion, and repainting. The Keith Haring Foundation contributed $65,000 towards the restoration project, which includes an updating of its pedestal with new light fixtures to illuminate the piece at night. In addition to the Haring Foundation’s donation, the project received $10,000 in private donations via ArtCare, a fund dedicated to the conservation and maintenance of San Francisco’s Civic Art Collection, which consists of some 4,000 artworks valued in excess of $90 million. 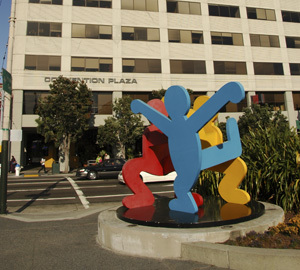 The sculpture, which was purchased and installed by the city in 2001, is expected to return to Moscone Center this summer.